The announcement on New Postage Rates effective 2 April 2013 is on Royal Mail's website here. This is a summary of the rate changes. 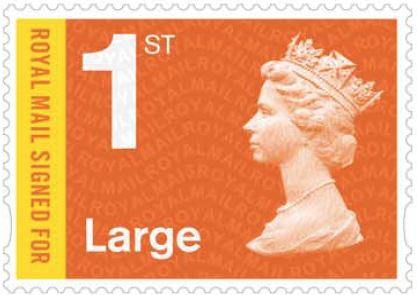 Royal Mail have rebranded the inland service into UK Standard, UK Confirmed and UK Guaranteed. UK Standard is the basic service. The price of 1st and 2nd class letters remains unchanged at 60p and 50p; the price of Large Letters also remains unchanged at all weight-steps. The item headed 'UK Confirmed' was Recorded Signed For and will now be branded as Royal Mail Signed For. It offers a signature on delivery for £1.10 (increased from 95p). Two redesigned stamps will be issued for this 'Signed For' service - see below. 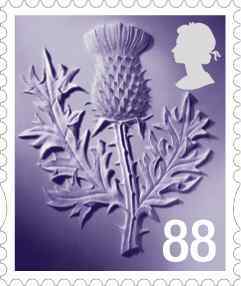 The new stamps will be priced at £1.55 and £1.85 on issue and £1.70 and £2.00 from 2 April. UK Guaranteed includes the Special Delivery 9am and 1pm services for letters. The cost of the minimum 100g 1pm service is £6.22 (old rate £5.90). The 500g rate is £6.95 (up from £6.35). The 100g 9am service rises from £16.70 to £17.64. Inland packet and parcel rates have undergone a radical overhaul and it is best to download the Rate Leaflet as a pdf file here . 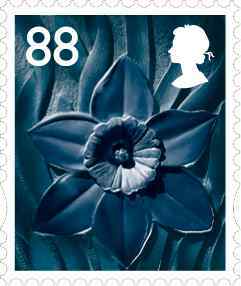 The current 87p airmail rate for worldwide postcards, 10g letters Worldwide and 20g letters to Europe increases to 88p with a new Machin definitive and new Country definitive stamps. The current £1.28 rate for Europe to 40g and Worldwide 20g letters remains unchanged. 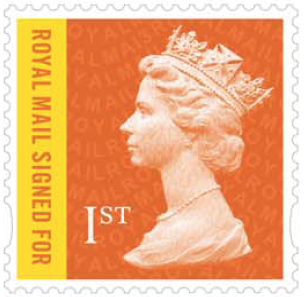 The Worldwide 40g letter rate is reduced from £1.90 to £1.88 (so a new stamp). The category previously known as Small Packets up to 100g is now referred to as Small Parcels up to 100g. The prices increase from £2.70 to £3 Europe and from £3.30 to £3.50 rest of the World. Airmail rates over 100g are reduced to 8 steps of 250g, replacing 21 steps. This means some complicated changes, some up some down. Whilst the current rates to Europe are £2.93 (150g), £3.16 (200g) & £3.39 (250g) these all rise to £3.50 for 250g. On the other hand the Zone 1 rate for most of the rest of the world becomes £4.50 for 250g, replacing £3.86, £4.42 & £4.98 for the same three weight steps. This pattern is followed for higher weight steps: Europe is more expensive, many rates for the rest of the world are lower at the top of each step (say 900g & 1kg), but higher than the lower weights (800g). Mail order suppliers will need to examine their products and packages to assess what to charge from April. International Signed For rises from £5.15 to £5.30; Airsure is complicated by VAT within EU countries, but the rates appear to be the same. 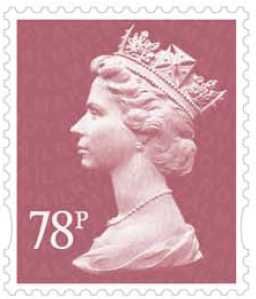 Surface mail - the basic 20g rate increases from 77p to 78p (new stamp). Weight steps above 100g are regrouped in 250g steps as for airmail. The 500g rate is 1p cheaper than before. 78p Orchid Mauve, 88p Amber Yellow, £1.88 Sapphire Blue. 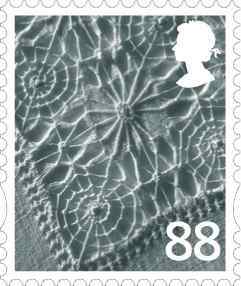 Some images of actual stamps are now available. Although the official information from Royal Mail was that these would be printed by De La Rue as normal, we now understand that the new value Machin definitives are printed by Walsall Security Print (in gravure). The Signed For may be printed by Cartor - which means in litho as far as we know. One report said that Enschede were involved as well, but we haven't had any of this confirmed by Royal Mail. These studio mock-ups show all the stamps coded MA13 in the conventional positions. All stamps have been printed by De La Rue in gravure. 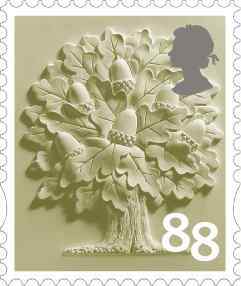 The 88p country stamps showing the Oak, Thistle, Daffodil and Linen Slip Case are printed by Cartor Security Print in litho. [22 March] We've been told unofficially that these are printed by Cartor on one primary sheet of eight grid positions, five grid positions for England, one each for Scotland, Northern Ireland, and Wales in sheets of 25. Royal Mail have now confirmed that the valued stamps were printed only* by Walsall Security Print, the country stamps only by Cartor (in litho), and the Royal Mail Signed For by De La Rue (in gravure). I have had confirmation from Post Office sources that the Signed For stamps have been delivered to the Swindon Supplies Depot and are being distributed to Branches by special delivery this week. My local office has no Signed For yet. Distribution to registered dealers was the same as to PO branches. I'm "happy" with this rise, I think I can live with a penny rise for first rate of international airmail (was not a happy bunny last year).. I presume that if the postal rates do not change again before April 2014 and the Dr Who Prestige Booklet is withdrawn on 26th March 2014 then this will become the only Prestige Booklet in this decade to be sold at a constant selling rate by Royal Mail. What happens with old recorded signed for stamps. Do they stay at the old value or go up in value the same as signed for? As with all NVIs, the value should increase on 2 April. We've not been told that they will be invalidated. The original 'E' rate stamps issued at 30-40p from 1999-2004have a current value of 87p and will rise to 88p. As an overseas customer, my supplies of Machins comes directly from Royal Mail seldom through dealers. I happen to place a repeat order of cyl blocks of the low values ex D1 (2011). To my surprise, the stamps supplied by Royal Mail this time differs a lot from the previous ones. Low values ex D2 (2013) have slits T2a (some dealers state T1, but mine are T2a) just like the 2011 issues ex D1 which I got just after they were released in 2011. My repeat order of the D1 2011 stamps which arrived a fortnight ago are interesting. 1. All of these have the Queen's head in paler color and the colors of stamps are bright in contrast. 2. Slits on 1p, 10p, and 20p are type T1 others being T2a. 3. the "p" of the value tablet is thiner on the 5p, 10p and 20p while it is thicker on the 2p stamp. The above differences are as compared to the stamps i got in 2011 when they were just released (collectors pack). Can anybody explain this to me? Also, a better idea... place a new order for these and see the difference yourself. Have a great day all of us. I have today received a letter from the bureau that dispatch of this issue is delayed from the 27th March until the 11th April due to circumstances beyond our control. "Unfortunately I am unable to guarantee that the issue will be with you for the 27th March (dealers normally get them well in advance) we will however endeavour to have them with you as soon as we can. I am led to believe that the stamps will be available at PO Counters on the 27th. (however, no packs or other products will be available). " Does this mean that the Royal Mail Signed For will be delayed as well - as there is not a "Value" shown the tariff change should not affect the printing?? It's all part of the same issue, Stuart, so yes. I don't think printing is the problem - we will probably find when we get the sheets that they were printed in January - but dsitribution. Dr Who is issued on 26 March. Any idea why they have issued a Machin for the 78p surface mail rate, when there wasn't one for the previous 77p rate? We're told a lot, but not everything. And if we asked them, I doubt if we would get an answer. Details of printers added today - though these are not all confirmed.